SQLite backup can be simple but tricky, as a typical SQLite database is merely a file, no more. You can copy this file… and get too many errors to handle with. Alternatively, you can trust to a recommended backup solution, Handy Backup, and do all SQLite copy table actions without an effort! The second method is to set up an ODBC driver for SQLite and then use the Database tool. Both methods can provide an effective SQLite backup and restore. We are recommending you using the first method usually, and turning to ODBC configuration when you wish to set up a multi-source backup task processing many different databases. Advanced services, such as notifying users, “stealthy” run and executing other programs. These advantages allow users completely automating and customizing SQLite backup operations. Start Handy Backup and run a new task wizard using the “New task…” menu item or a button on the management panel. 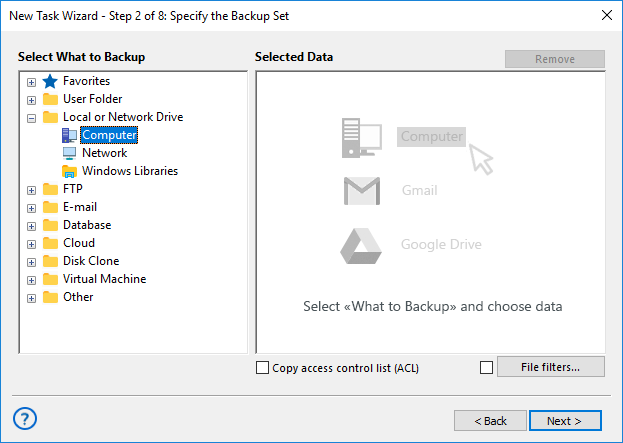 Select a backup task on a Step 1 and proceed to Step 2, where you must select a “Computer” data source. Select your SQLite files (often having extensions such as .sqlite or .db3) for backing up. 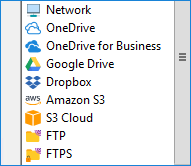 Note: You can use the “File filters…” option to seek the files you need by extension or by name. Then click OK and proceed creating a task according to wizard steps. These steps are not specific for SQLite backup. Finish your task wizard after all completing steps. Your task will be ready to run automatically! That is all. Handy Backup requires no further steps for automating the SQLite backup job. A Professional solution can automatically backup SQLite databases along with any other user-type and professional-grade data you use in your daily job. Free 30-days trial version! Besides using Handy Backup, other ways to save a copy of SQLite database are existing. Here we are shortly describing some of these ways. Using scripts. A classical way of backup, scripts or batch files can be used to force SQLite copy table or just for copying the file. Using scripts requires some skill and knowledge, however. Internal tools. SQLite can provide an instrument for backing up tables, although forums are full of complaints about the quality of this tool and the unpredicted errors emerging from it. Copying tables manually. You can use any file manager to copy a SQLite data from one place to another; it is merely a file. The comfort and reliability of such a solution is completely a matter of your personal taste! Using Handy Backup for saving SQLite data copies, you can guarantee yourself from flaws, errors and inconveniences of any other way to backup SQLite databases. 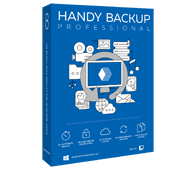 Try the might of Handy Backup by downloading a free, full-scale trial version on a 30-days test period!